My outdoor experience began in high school with involvement in a local canoeing/camping group called Canoe Trails. The culmination was a 10-day canoe voyage through the Quebec wilds. I've been backpacking since my college days in Pennsylvania. I have completed all of the Appalachian Trail in Georgia, Tennessee and North Carolina. My typical trip now is in the Sierra Nevada in California and is from a few days to a week long. I carry a light to mid-weight load, use a tent, stove and trekking poles. The Astral 40 pack is part of Black Diamond's Enduro series and is specifically designed for women. The volume capacity for the small size is 38 L (2,319 cu in) with the recommended load capacity of 25 - 35 lb (11 - 16 kg). The pack features a reACTIV suspension which refers to three design elements that combine to allow more natural and comfortable movement. First is the 6061 aluminum frame which is a lightweight 4mm (.16 in) diameter formed aluminum rod. An internal plastic framesheet also provides some of the back support. The back panel has deep grooves and is covered with a light mesh. Second is the reACTIV hipbelt design which is fixed in place but is able to move side to side and cant with body movement. There are side stabilizer straps on the hip belt which hold the hip belt more firmly in place when tightened and allow freedom of movement when loose. There is no torso length adjustment possible. 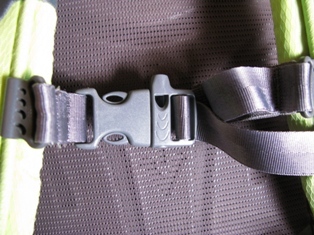 Unlike packs with their ergoACTIV design, the hip belt is fixed in place. The hip belt is padded and adjustable with a small zippered pocket on each side. Third are the SwingArm shoulder straps which connect to each other at the bottom of the pack with a cable and housing to allow for smooth, low-friction movement. The shoulder straps are padded and cut to fit a woman. There are load lifter straps on each side and an elastic loop for holding a hydration hose in place. The sternum strap is adjustable along the length of the shoulder straps for placing it in the right spot. It has an elastic section to allow for movement. The coolest thing is that the male side of the buckle is designed to be a whistle. The top-loading main compartment closes with a roll top similar to those seen on dry bags. Inside is a strap for holding a hydration reservoir which folds and secures with a hook-and-loop closure. There is one port in the center for routing the hydration hose. The lid which has a zippered pocket with a keyclip inside, is held down by two straps and is easily removable. The pack secures without having to use the lid. On the front side there is a stretch mesh pocket. The top of the pocket has a strap at either side to hold it closed. With the straps unbuckled the pocket opens into quite a large space. There are compression straps and stretch mesh side pockets on either side. The pocket tops are angled to allow for reaching them with the pack on. There are two ice axe loops which have a spot of stitching spaced away from the attachment to the pack. This allows just enough space to slip the tip of my trekking poles in. At the upper side of the pack are two loops that contain the grip portion of my poles. The pack is mostly as advertised on the website. However, the suspension is a little confusing. The website first states that it has the reACTIV suspension but then the first bullet point below says it has the ergoACTIV suspension. The hangtag lists all of the pack types in the Enduro series and the features associated with each pack. It lists out the details of all of the features in one spot so unless I read carefully it is easy to assume that my pack has all of those features. 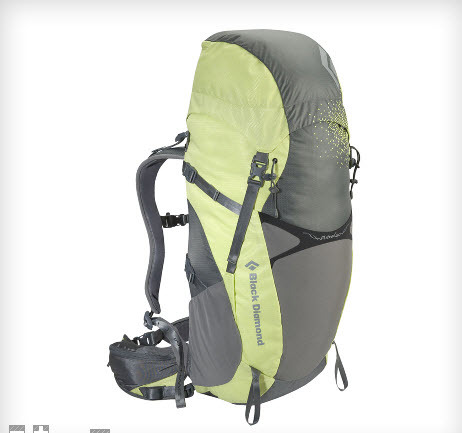 I am familiar with Black Diamond packs and features so I could see from the photos what style it was but there can be some confusion. My first impression was how small the pack was. The straps were connected in such a manner that the pack was very neatly contained. I then cut off the hangtag and immediately weighed it while it was in such a neat state knowing that I wouldn't be able to get it so compact ever again. I was surprised and disappointed to find that it weighed 5 oz (142 g) heavier than advertised. As I investigated the pack more I became convinced that there must be some packing inside to make it this far off but I never found anything inside and re-weighed it multiple times just to make sure. I tried on the pack and was happy to find that the small size fits me perfectly. I then enjoyed examining the pack to identify all of the great features. 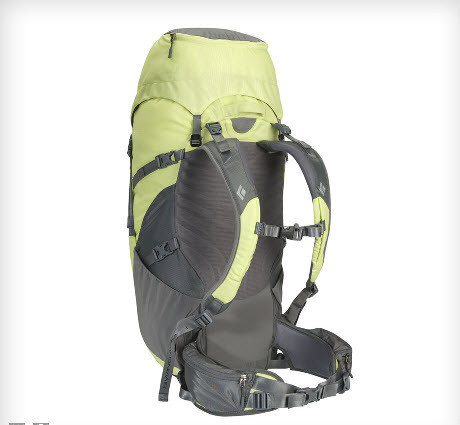 This pack seems to be just exactly fit for my type of backpacking in that it is lighter weight and smaller volume but has a lot of convenient features. I can't wait to get it loaded up with gear for a trip! Once I figured out why the sternum strap buckle looked different to me since it doubled as a whistle, I tried to make it work. I was easily able to get quite a loud whistle from it. This is a really neat feature since it is smart to have with me but isn't something that I want to carry separately. Hand wash in cold water with a mild detergent. Do not use bleach. Hang to dry. There is a one year limited warranty for defects in material and workmanship. During the Field Testing period I used the Black Diamond Astral 40 for three multi-day trips and three day hikes for a total of ten days of testing. Loads ranged from 10 to 21 lb (4.5 to 9.5 kg). Pinnacles National Monument, California: 2 days of hiking with fully loaded backpack of 15 lb (6.8 kg); 10.9 mi (17.5 km); 1,260 to 2,100 ft (384 to 640 m) elevation; 28 to 70 F (-2 to 21 C). Sequoia National Park, California: 1 day of hiking 3.6 mi (5.8 km) and 1 day of snowshoeing 5 mi (8 km) with partly loaded backpack of 12 lb (5.4 kg); 6,200 to 6,700 ft (1,890 to 2,042 m) elevation; 55 to 65 F (13 to 18 C). 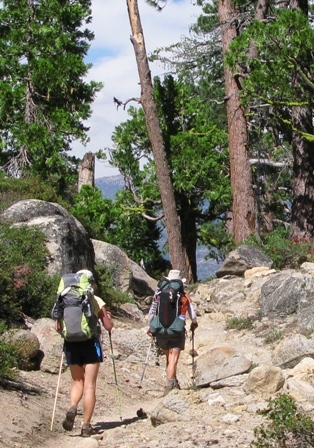 Hunters Trail, Sierra Nevada (California): 3 days of backpacking with fully loaded backpack of 21 lb (9.5 kg); 20 mi (32 km); 3,500 to 5,000 ft (1,067 to 1,524 m); 35 to 65 F (2 to 18 C) . South Fork American River Trail, California: 10.9 mi (17.5 km); 800 to 1,200 ft (240 to 370 m) elevation; 60 to 75 F (15 to 24 C). Pack was partly loaded and weighed 10 lb (4.5 kg). 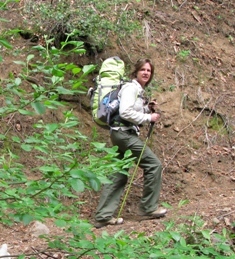 Auburn Recreation Area, California; 3.6 mi (6 km); 500 to 1,500 ft (150 to 450 m) elevation; 35 to 55 F (2 to 13 C). Pack was partly loaded and weighed 12 lb (5.4 kg). Forni Lake, Desolation Wilderness, California: 10 mi (16.1 km); 6,600 to 7,100 ft (2,012 to 2,164 m) elevation; 55 to 70 F (13 to 21 C). Pack was partly loaded and weighed 12 lb (5.4 kg). The Black Diamond Astral 40 has quickly become my favorite pack. I like the smaller volume since I can still easily fit all of my gear and have plenty of options for strapping on additional items if I need to. There are several great features that I like enough to be willing to carry the pack's slightly higher weight just to get those features. My expected favorite was the hip belt pockets, but the biggest surprise is that I also am really enjoying the lid. I typically either carry a pack without a lid or remove the lid to save weight. However, with the Astral I am enjoying having this convenience. I especially appreciated it in an hours-long rainstorm. It poured for several hours while backpacking and when we got to camp we were extremely fortunate to find a gigantic pine tree which was still somewhat dry underneath. I hadn't planned for the rain and had put a library book on top of my main compartment and a paper instruction booklet in the lid. I quickly unpacked expecting to find both items ruined. To my surprise the book was completely dry as was everything in the main compartment and the instruction booklet was only slightly damp. Wow! However, I later learned a lesson as to how well the pack wicks. Overnight I left the pack under my vestibule on well-drained pine straw expecting it to stay dry. By morning the entire pack was completely soaking wet. By morning the rain had stopped so I hung the pack up for a few hours and when I put it on it wasn't uncomfortably wet. It dried during the day while hiking. The side pockets are well-placed; I can access them myself without dislocating my shoulders. I store sunscreen, insect repellent, maps and my water bottle in them. I can typically retrieve and stow these items without assistance. However, I do notice that when my pack is extremely full that it can be difficult to stow my liter water bottle without help. The fit is noticeably designed for a woman and is very much appreciated. I like the narrower shoulder straps and they don't restrict my movement when reaching or scrambling. I could even cast my fishing pole with no restriction. On the hike in Pinnacles there is a section that goes through a lengthy cave section. Although my pack was fully-loaded I was able to maneuver through some tight spaces without have to remove it. The small torso length is right for me and allows for a really good fit on my back. I have a shorter torso and have difficulty with 'normal' sizing especially those meant for men. My poles fold so compactly that I cannot use the ingenious pole stashing straps on this pack so I end up using the outer mesh pocket or side pockets for holding them. The main compartment opening is fabulous; it appears to be like a funnel which makes for very easy loading. Then the roll-top closure is easy to use and feels very secure. I used the front mesh pocket for my map and hat but haven't yet had the appropriate weather to use it for drying clothing. I used the water reservoir loop on a few trips for hanging my 2L Platypus and had no problem with it. At first it seems odd to not have a sleeve for the reservoir but since most sleeves aren't waterproof anyway, if my reservoir would burst it wouldn't provide much protection for my pack contents. I carry my crucial items (clothing, electronics, and sleeping bag) in a dry sack anyway. I even used the emergency whistle multiple times on our Hunters Trail trip. It is loud. We (the girls) did a long excursion hike while the guys scrambled down to fish the river. On our way back we used the whistle periodically to see if we could locate them. We failed to do so but it wasn't the fault of the whistle. They had just gone much further downstream for better fishing. The comfort has been outstanding. Of course my back gets sweaty but the ventilation seems as good as any pack I've tried. My hip bones and shoulders weren't sore the next morning and the weight-distribution feels very comfortable. I used the Black Diamond Astral 40 pack on two multi-day trips during the Long-Term Test period for an additional nine days and seven nights of use. Yosemite National Park, Sierra Nevada, California: 5 days; 37 mi (60 km); 4,200 to 9,400 ft (1,280 to 2,865 m); 45 to 75 F (7 to 24 C) with clear conditions. Pack weight was 17 - 20 lb (8 - 9 kg). Loon Lake, Sierra Nevada, California: 4 days; 13 mi (21 km); 6,327 to 6,700 (1,928 to 2,040 m); 40 to75 F (4 to 24 C) with clear, cloudy and thunderstorm conditions. This trip was a backpack trip into a base camp followed by day hiking, swimming, kayaking and fishing. Pack weight was 15 - 20 lb (7 - 9 kg). The pack continued to perform very well throughout the test period with the smaller volume working out perfectly for me. I had no problem fitting in all of my gear and the funnel-like top makes it a breeze to load. I have used the lid on every trip since I love having the extra-large pocket for accessing items on the trail. However, I will probably try a trip or two without it when I'm looking to save weight. There is still enough room in the pack for me without the lid. I changed from carrying a 32 oz (1 L) water bottle in the side pocket to carrying two 16 oz (1/2 L) water bottles with one in each side pocket due to the difficulty of using the larger bottle while hiking. The smaller bottles were manageable for me to access during rest stops without removing my pack and without any help. I would prefer to carry the bottle on my shoulder straps however and am thinking of making some loops to hold them there for better access. On the Yosemite trip, I dried laundry on the last three days in the outer mesh pocket. It was nice to have the pocket in order to keep my clean clothes away from my dirty camp shoes. 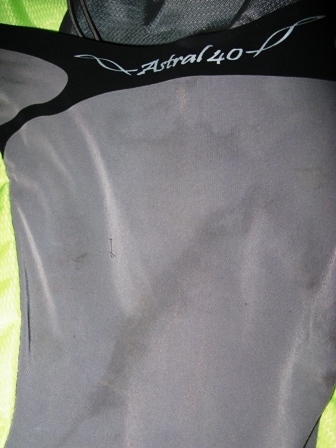 The clothing dried fairly well but I had to pull it out during stops to let things dry out better in the sun. The mesh got stained from residual dirt on our wet 'clean' socks that apparently hadn't gotten completely washed out. The comfort has been very good and I never had those mornings where I dreaded to don my pack due to sore hip and shoulder points. The durability has been good with no noticeable stressed seams, discoloration, fading or damage other than a slight abrasion and a pulled thread on the mesh pocket. 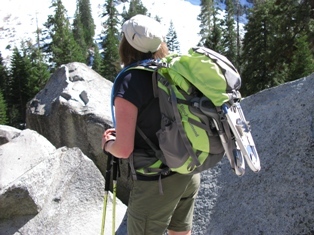 I am careful to set my pack with the straps leaning onto something but there were many occasions of bushwhacking where something could have snagged onto the pack. I used the pole storage straps for holding my water shoes which worked very well and made it easy to secure them. The Black Diamond Astral 40 pack has become a favorite of mine and fits my style well. It is a well-designed women's pack with just the right amount of space and just the right trade-off of features to weight. I love it! This concludes my Long-Term Report and this test series. Thanks to Black Diamond and BackpackGearTest.org for allowing me to participate in this test.